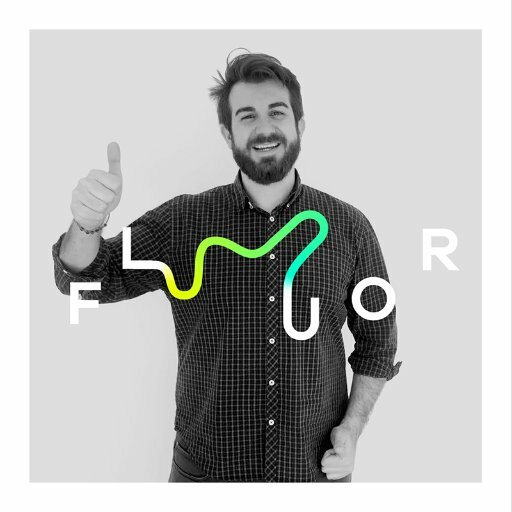 CEO at FLUOR (creative innovation agency) and founder at Innovación Audiovisual. Morover, he is director at Postgraduate Branded Content y Transmedia Storytelling (Inesdi), EuroTransmedia Advisory Board member, New Media teacher at Escuela Internacional de Cine y TV de Cuba y author at eduardopradanos.com. We are an agency of creative innovation, whatever the approach or platform. Our specialty is content; we understand advertising as a contribution of experiences presented to consumers so that they can decide upon settling on one product or another. And through this Connect + Develop methodology we can solve any brand challenges from any service perspective. We have no barriers. Any trend, innovation or media we can think of, we are going to introduce into our proposals. From strategic campaigns that run for several years to tactical responses with great media coverage and impact; from a wearable connected to social networks to transmedia content that begins with television. It is only the idea chosen as the solution that sets the boundary. This will allow us to enhance real-time connection within the areas of innovation and predict new novelties for the public before anyone else. And thanks to this, the creative solutions we offer are more effective. 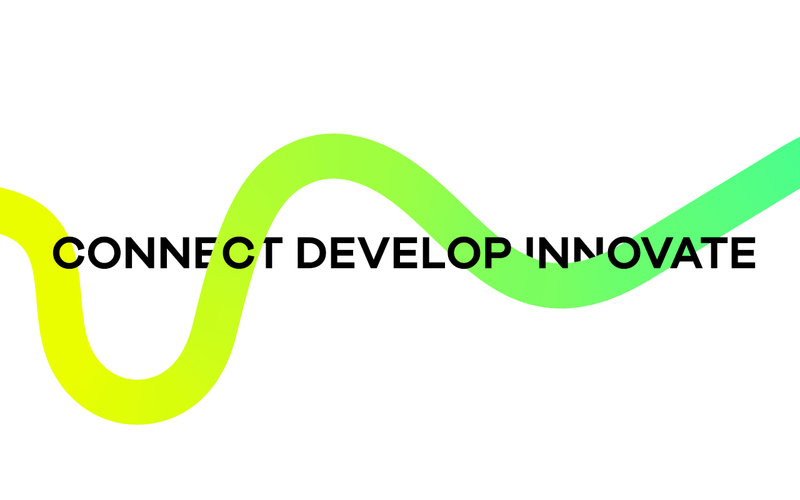 On top of this, the Connect + Develop methodology allows us to work with real experts in environments of real innovation. It helps us improve and adapt our service to clients and streamline work processes. And above all it allows us to devote a great part of the budget to the project itself, improving efficiency and honest budgeting. We fully understand the need for a controlled quality service. But be warned, we’re not low cost. What we do guarantee is that for every euro the client spends, the maximum possible percentage goes into their project and not into highly inflated operating costs. 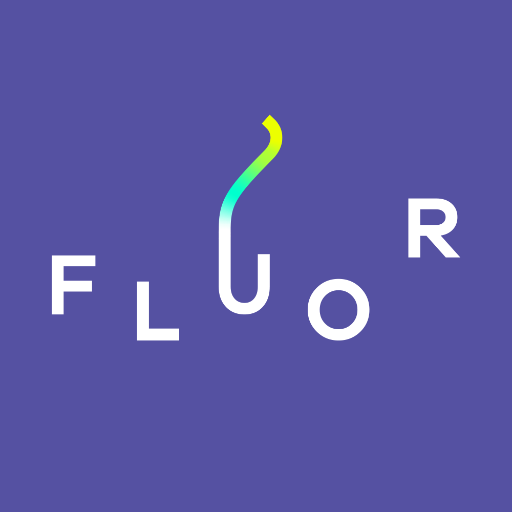 FLUOR was created with the following company structure: a Strategy Director, a Director of Production, a Customer Service Director, a Social Media Manager and an Art Director. We also have a number of specialized collaborators in the fields of Technology, Research & Insights, Audiovisual and Physical Production as well as in the legal field. 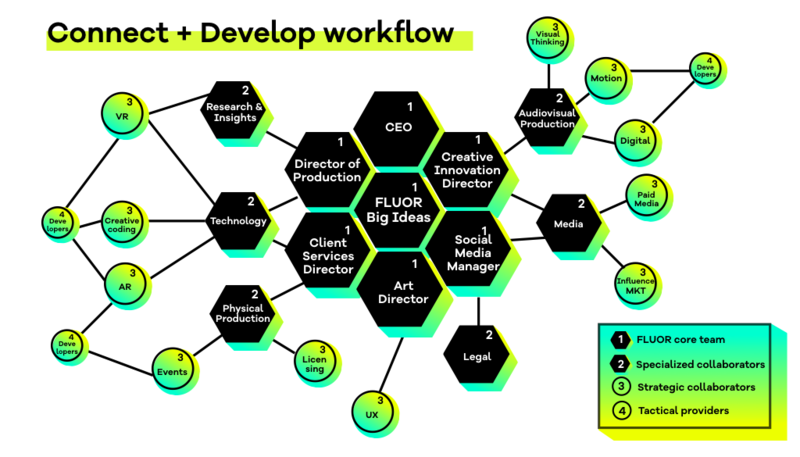 Within FLUOR’s structure we also have a network of strategic partners in Paid Media, Marketing Influence, Visual Thinking, Creative Programming, Virtual Reality, Augmented Reality, Events, User Experience and Motion Graphics. And finally, on the fourth level are the providers we work with because of their specialization in fields in which we have no interest in having these profiles within the structure of the company. In addition, we will shortly announce a promising agreement with one of Spain’s main audiovisual production agencies. But the most important and the biggest point of difference from other agencies is that we have a network of national and international talent that we draw from depending on the nature of the project so that we can provide our clients with the best ideas. Thus, we have achieved the perfect mix of a cohesive team of about ten people as the nuclear core of FLUOR, and the modularity to create infinite possibilities of involving more talent depending on the needs of each project. Our strengths are based on strategic innovation and the generation of content and entertainment experiences. We come from environments that are very linked to technological creativity, branded content and transmedia strategies, but without forgetting classic advertising. We want to change the mental processes of modern communication. We want to advertise without it being advertising, in a strategically profitable way and for it to be an experience that consumers remember all their lives. And we believe that focusing on the public’s lifestyle is what allows us to achieve it. In July I wrote an article for my blog where I explained what the agency model that we were building. And now that we are launching it we feel very proud to say that this is our path: an agency focused on innovation for major brands with which we can be honest with our clients and share in their successes. We don’t like many of the things about advertising today: egos, the dishonest interests that encroach on what clients really need and the insane rivalry that leads the best decisions to not be taken. And so it is that FLUOR is born.